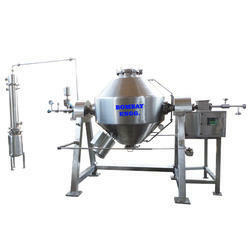 We are Leading Manufacture and Supplier of the Rotocone Vaccum Dryer. : Roto cone Vacuum Dryer is ideal for temperature sensitive materials. Clean internal design provides complete discharge and reduces crossbatch contamination. Roto cone Vacuum Dryer is ideal for temperature sensitive materials. Clean internal design provides complete discharge and reduces cross batch contamination. manufactured as per cgmp standards with 5 nos. Mechanical seals. : suitable for heat sensitive free flowing materials. : loading is upto 50 to 65% of gross volume. : options for extended shaft, drum charging, variable speed, plc control, solvent recovery. We are leading Manufacturers of Rotocone Vacuum Dryers, Exporters of Rotocone Vacuum Dryers. It is suitable for drying the material which can not operate at low Temperature easily oxidized, poisonous in nature. Roto Cone Vaccuum Dryer is applicable to dry raw materials of pharmaceuticals, chemical, Pesticides, foodstuff , dyestuff and so on industries. The Roto Double Cone Vacuum Dryer is suitable for drying the material which cannot operate at low Temperature easily oxidized, poisonous in nature. Roto Cone Vacuum Dryers are widely used in pharmaceutical, bulk drugs and fine chemicals for drying, where drying by increase in temperatures are not possible. The materials could be ones which get easily oxidized, volatile materials, irritants or poisonous in nature. Extreme durable in nature, offered Rotocone Dryers are prepared with the use of best parts. These dryers show longer service life. 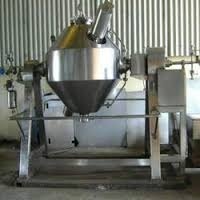 We Nes India Engineers offer Roto cone Vacuum dryer.